Ever find that from Monday to Friday you're a sartorial wizard, planning outfits the night before (hey, even two days before, if you're really organised), but come the weekend, it all goes to pot, especially when you've got a chic Sunday brunch in the works? Funny enough, you're not alone in this. We regularly come to the conclusion that we have nothing to wear on Saturday morning, resorting to rooting through the entirety of our wardrobe before giving up and turning to wine. Lizzy Hadfield of Shot From The Street always creates perfect casual looks. 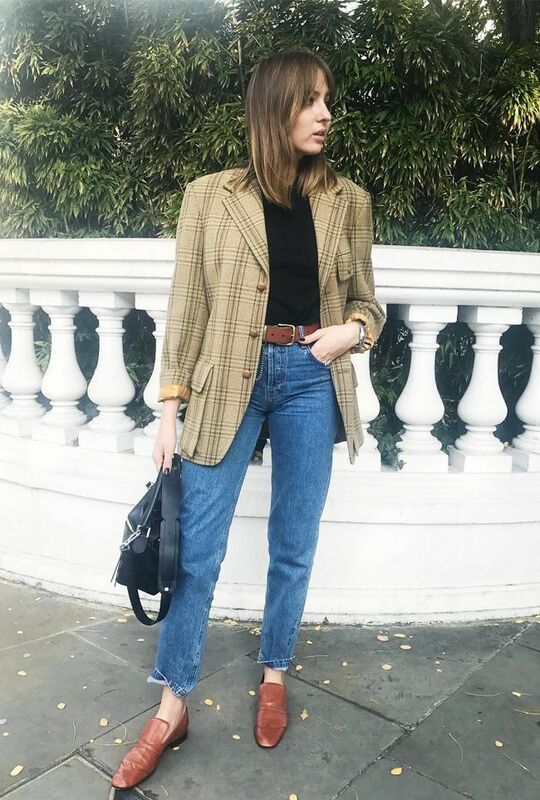 To remedy such dilemmas, we've trawled through the Instagram accounts and sites of some of our favourite bloggers for outfit inspiration that lasts from early brunch to last call. And you know what? You'll probably want to wear them all week too. Scroll through our gallery to see seven super-easy outfit ideas you can always rely on. Style Notes: The easiest way to be on trend and look chic during the weekend is to wear a checked blazer. They're everywhere right now but also available all over the high street. This one will last you for autumn and beyond. Style Notes: Another major trend this season is vinyl trousers. Instead of going for the predictable black, opt for a more unusual colour. Pair with sneakers, a box bag, and a sweatshirt. This Acne pair just shot straight to the top of our shopping list. Style Notes: Cardigans are back, people. And Emma Thatcher of A Style Album knows this too. On slightly warmer autumnal days, pair your jeans and sandals (hey, if it's sunny outside, why not), with a cosy knit. Belt this Weekday cardi if you want to give your outfit more shape. Style Notes: The trench coat will always be a staple of an autumn wardrobe. But what about all those pieces you wore throughout the summer? Should you just get rid of them? Take a leaf out of The Frugality's style book, and wear your gingham skirt into the colder months with Vans, a sweater and a trench. Style Notes: The easiest way to stay warm this autumn is to invest in the shearling coat. That means when you're still keen to wear your slingbacks, you'll still feel toastie. This is such a bargain. Style Notes: We've been following Ada Oguntodu for some time now, and we always go back for style inspo. Her use of colour is always bold, but somehow she dresses in the most accessible ways. This whole look is ideal for a night out or a fancy brunch on a Sunday. Everyone needs a polka-dot blouse in their wardrobe. Style Notes: Platform shoes are so fun that it's nice to bring them out at the weekend. But if you don't like the idea of cold toes, fear not—just grab a pair of socks, and wear them underneath for maximum fashion points. These from & Other Stories are selling out fast. Want more? Here are eight unique autumn outfit ideas to see you through the week.